Stunning views, historic architecture and Portuguese tarts? Lisbon basically has it all. Join BNKR + Valentina Ruby on a journey through the city’s hidden alcoves and colourful backstreets, getting matchy matchy with our surrounding and befriending a bunch of locals along the way (some furrier than others). Valentina leaves her hotel, pulls on her hiking (cowboy) boots + heads up the hill for a better view. She attracts a few looks on the way (they must like her boots too). Finders Keepers Lola Dress, coming soon. Green normally means go, but she’s taking it easy - it is her holiday after all. Shop Finders Keepers Mesa Jacket, Mesa Skirt + JAGGAR Concave Leather Heel. Necessary caffeine stop. Valentina takes her time to wander the historic streets (and introduces the locals to the latest in tonal dressing). Shop Keepsake Higher Lace Top. Shop Keepsake Higher Lace Top, Finders Keepers Aranciata Short + JAGGAR Concave Leather Heel. 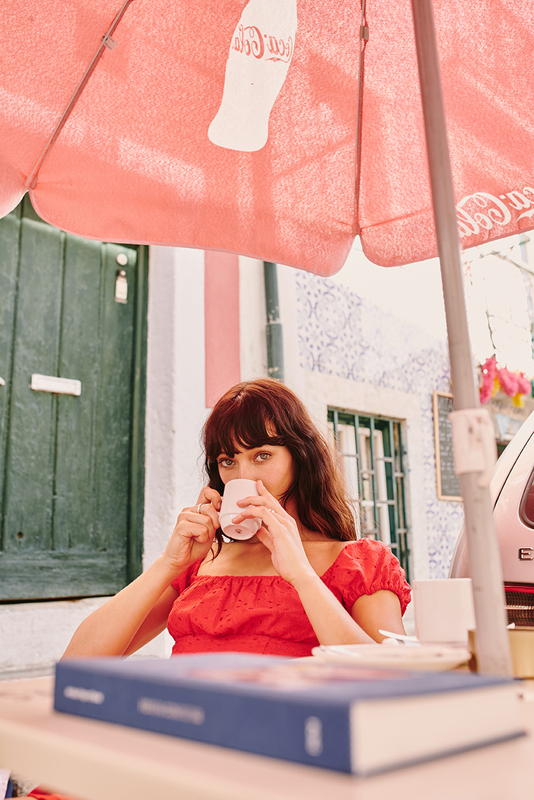 Valentina limbers up to continue her search for the best Portuguese tart in town. Current tarts consumed: 6. C/MEO Counting All SS Dress, coming soon. Best part of the day? Meeting new friends - although this one is a little furrier than most. Shop The Fifth Iris Check LS Dress + JAGGAR Concave Leather Heel. Shop The Fifth Iris Check LS Dress. After a steamy day in the sun, she slips into something a little more fancy - and lucks upon golden hour on her way to dinner. Shop Keepsake Allure Mini Dress. It’s important to catch up on current affairs while abroad (even if your Portuguese is a little rusty). Option #2 - use newspaper as hat. Shop C/MEO Devoted Jacket + The Fifth Recurrence Short, coming soon. One moment please - Valentina heads back home for a quick outfit switch. In head-to-toe yellow, she matches the intricate tiles in a hidden alcove. Perfect, no? Shop C/MEO Elate Top, The Fifth Lillian Skirt + JAGGAR Concave Leather Heel. Shop The Fifth Lillian Jacket, Lillian Skirt + JAGGAR Concave Leather Heel. Every corner + backstreet holds a new story. Valentina commits these to memory. C/MEO Sequence Top + Skirt, coming soon. Valentina keeps it light + breezy in a lilac mini for her last afternoon in Portugal. The Fifth Viva Dress, coming soon.